A forensic team investigates the scene of a murder in Olocuilta. Four gang members approached a female candy vendor on a secluded pathway in Montelimar neighbourhood and shot her over 20 times after she refused to hand over her earnings. Police patrol murder scene in Montelimar neighbourhood, Olocuilta. 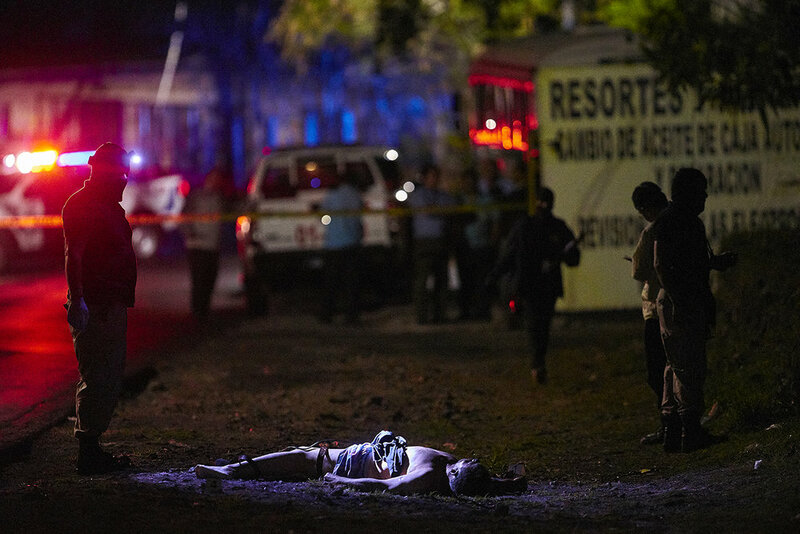 El Salvador is consistently among world’s most dangerous countries. In recent years gang violence has plagued the country forcing many citizens to flee in migrant caravans in search of a better life to the north in the USA. Grafitti tag marking MS-13 territory in Illopango in the outskirts of San Salvador. Ex MS-13 pandilleros Nelson and Franklin serving time for homicide and extortion respectively, stand in their cell in Apanteos prison. (From left to right) Manuel Pérez, Carlos Salguero, José de Paz, Ángel Hernández, Yancy De León on the scene of a car crash in San Salvador. Comandos De Salvamento is one of many paramedic groups in San Salvador. at the scene of an accdent many paramedics from different groups will arrive and provide support and assistance to each other. at this emergency there were 3 CDS ambulance crews providing support to 2 Red Cross crews that arrived on the scene before them. The general Salvadorian public continue to live their lives the best they can under the near constant threat of violence. 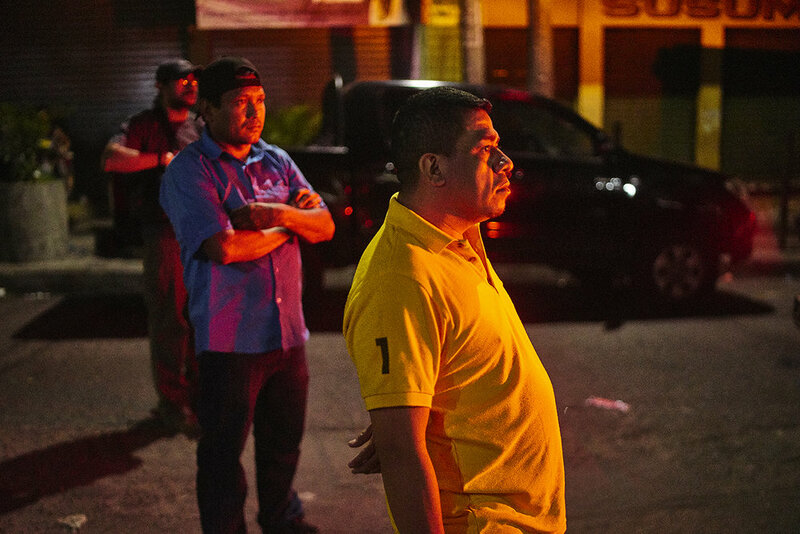 Cammandante Arevalo during a raid on suspected gang residencies in Central San Salvador. Horacio, an ex MS-13 gang member serving time for homicide, wears a Roman soldier outfit that he made for recent Easter celebrations. The costume was made during an arts and crafts programme which is part of ‘Yo Cambio’ a government run scheme to provide inmates with High school equivalency qualifications to better equip themselves for life outside of prison. Apanteos Prison. Police raid the house of a suspected gang member. a substantial amount of cocaine was found in the property. A teenager lays dead in the street after an altercation with gang members. Police surmised that he had some involvement in drug dealings. his motorbike was stolen. A prostitute waits on a street corner during a rainy evening in Centro San Salvador. women have many roles in gang life. many of these roles are exploitative and they a regularly the victims of extreme violence. with rates of femicide in El Salvador among the highest in the world. The mother of teenager murdered for his motorbike is comforted by relatives after police confirmed it was her son’s body on the other side of the police cordon. Police transporting gang members in downtown San Salvador. MS-13 gang members newly arrived at Apanteos prison are kept in a cramped holding cell separate from the main population. Approximately 75 prisoners have been held in this one cell for up to 90 days with only 5 minutes per day outside to either shower, make a call or use the toilet. Francisco (left) a night shift photographer for popular national tabloid newspaper La Prensa Grafica, enjoys pupusas with colleagues during a short break on a busy Saturday night in San Salvador. Police set up a cordon around a crime scene in MS-13 controlled downtown San Salvador. Two murder suspects led police on a short high speed chase through the city before abandoning their car and fleeing on foot. A Comandos De Salvamento ambulance parked at the scene of a young boy injured by a puncture wound to the leg. San Salvador. Police investigate the the murder of a man who was shot in a car on a desolate stretch of highway between San Salvador and La Libertad. Kalo prepares to shoot footage at a police cordon in Mejicanos. Down time at the Comandos De Salvamento headquarters in Central San Salvador. A suspected gang member lays prone on the floor whilst armed police search his home. Kalo and Francisco plan a route to the scene of a Homicide in Illopango after a getting a whatsapp message from a contact. A man in his 60s was assassinated by gang members and then left on a secluded stretch of road near Illopango women’s prison. his semi naked body had been bound and then wrapped in a heavy blanket. An ex gang member displays his tattoos, Apanteos Prison. The prisoner, serving multiple life sentences for multiple homicides. is part of the Yo Cambio (I Change) Government scheme aimed at rehabilitating prisoners through educational and religious programmes. Manuel serving a 10 year sentence at Apanteos Prison for an Extortion conviction. Pastor Saul conducts a sermon during a Culto for Ex addicts and gang members in Mejicanos. Kalo speaks with a forensec lead investigating the shooting of a young man in a restaurant in Downtown San Salvador. A couple dances in a restaurant late on a Saturday night in San Salvador. less than 100 metres down the road police investigated the murder of a security guard in another restaurant. Onlookers at the scene of a shooting homicide in downtown San Salvador. A security guard was shot in a late night restaurant. his gun was stolen in the incident.